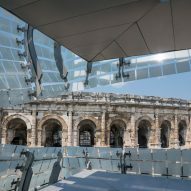 Franco-Brazilian architect Elizabeth de Portzamparc has completed a museum of Roman history in the French city of Nîmes featuring glazed facades intended to recall the draped fabric of a toga. 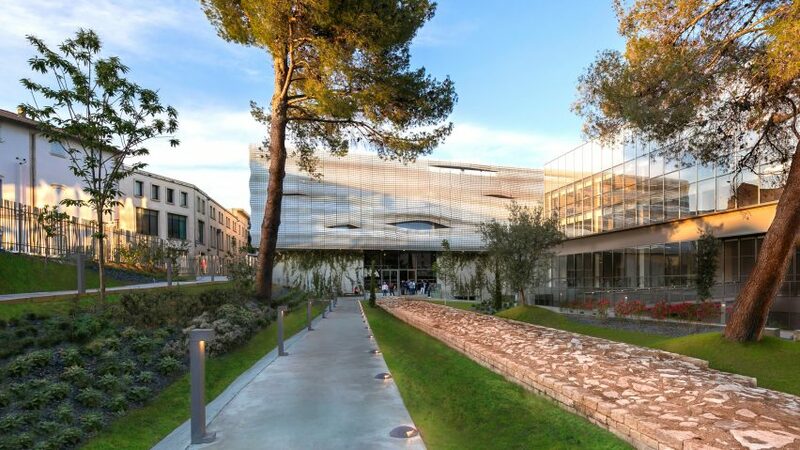 The Musée de la Romanité stands opposite a Roman amphitheatre on the edge of the city's Écusson district, where it straddles the ruins of a Roman rampart. 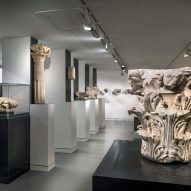 De Portzamparc's Paris-based studio designed the 9,100 square metres building to exhibit around 5,000 of the museum's 25,000 archaeological artefacts. The building is positioned at the junction where the medieval and modern districts of Nîmes once met. This setting informed a design that functions as a gateway linking the neighbouring buildings with a public square surrounding the amphitheatre through a series of axes and openings. The museum's form and materiality offer a contemporary contrast to the ancient amphitheatre, with its fluid and diaphanous glass surfaces in tension with the Roman building's monumentality and structural rigour. 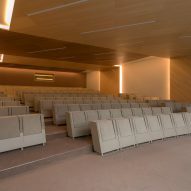 "A very light architectural design, made possible by current technology, seemed an obvious choice to me," de Portzamparc explained, "as well as the need to express the differences between the two periods through an honest dialogue based on their complementarity." "On the one hand," she added, "a round volume surrounded by vertical Roman arches in stone and solidly anchored to the ground – on the other, a large and floating square volume clad in a toga of glass drapery." The glazed volume rests on a base that is entirely enclosed by transparent glass walls, permitting a view through the building from the Rue de la République towards the amphitheatre. At the heart of the museum is an interior street that follows the remains of the Augustan rampart and provides a publicly accessible route across the site. This street is visible from every level and ensures a sense of openness and connection between the various spaces. 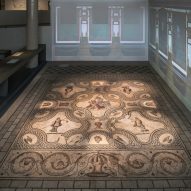 The public street also enables visitors to explore the museum's bookstore, cafe and restaurant, as well as leading towards a 17-metre-high atrium containing a fragment from the gateway of the pre-Roman Sanctuary of the Fountain. The 70,000 square glass plates enclosing the building's upper storeys are intended to evoke the ancient decorative art of mosaic and are fixed to a framework that results in a fluid surface resembling draped fabric. Each glass panel is screen printed to give a translucent quality that reflects light in different ways throughout the day and the seasons. 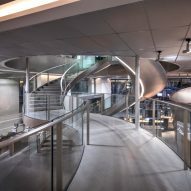 The museum's interior functions as a continuation of the urban fabric, with interior streets connecting plaza-like gathering places, and built elements used to house the exhibits and break up the semi-open spaces. Elizabeth de Portzamparc was also responsible for the museography, which separates the exhibits into three main chronological periods. 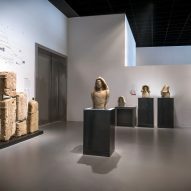 Multimedia devices and luminous white "knowledge boxes" present maps, historical timelines and screens that help to place the various artefacts in a meaningful context. 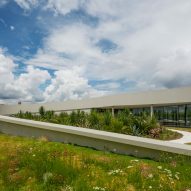 Visitors ascend gradually through the exhibition spaces and ultimately emerge onto a green roof terrace. This public space acts as a belvedere providing views across the skyline, with the amphitheatre in the foreground. At the base of the building is an archaeological garden that is also open to the public and enhances the connection between the museum and the surrounding urban fabric. The landscaped garden is organised around the Roman wall, which has been carefully restored along with all other remaining traces of the site's history. Photography is by Wade Zimmerman unless stated.